The calculator plots gain versus frequency for three phase inverter types: the long tailed pair (LTP), the paraphase, and the concertina, which is also known as a split-load or cathodyne. 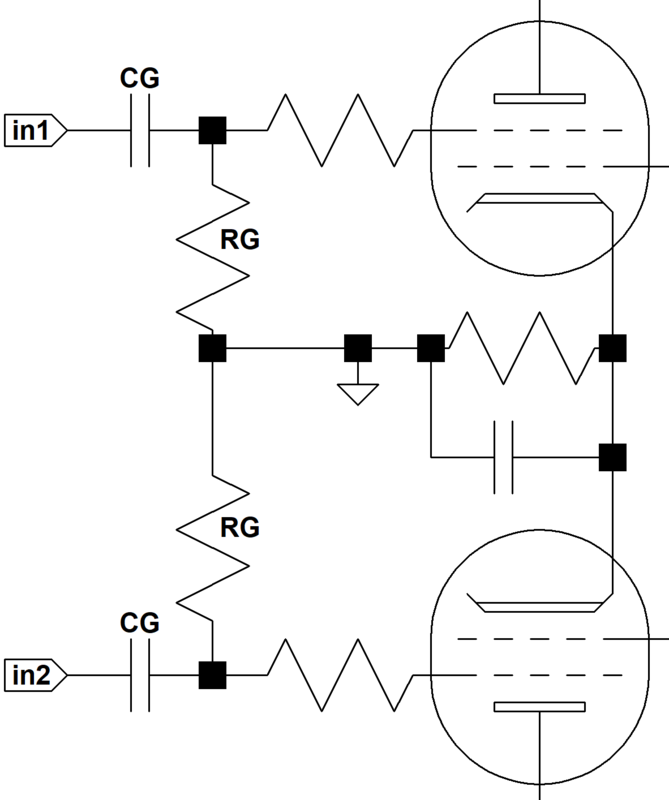 The coupling capacitors CG block the high DC voltage from the phase inverter while allowing the inverted and non-inverted audio signals to pass. The calculator computes the voltage gain measured from the phase inverter input to the grid of a power tube. RL is the phase inverter plate load resistor value. The voltage gain for the long-tailed pair is an approximate value for both phases and assumes perfect balance. Calculations for the paraphase also assume perfect balance between phases. The concertina response is only valid when the power amp is not overdriven. 2Morgan Jones, Valve Amplifiers, 2nd Ed., (Oxford: Newnes, 2003). 3Merlin Blencowe, Designing Valve Preamps for Guitar and Bass, (Raleigh: Lulu, 2009).